Rachel enters the Found Objects Found Art contest, with some memories of grandmother’s kitchen…. Well hello there! I recently found your blog while looking for ways to clean my Armstrong flooring. I can happily say it is now gleaning after an entire day spent on my hands and knees, that is. So I thought I would send a pic of part of my newest estate sale obsession: tiny porcelain animals. I remember my grandmother used to have them sitting all over the window sill above the kitchen sinks and I was so set on playing with them along with my barbies, to no avail. 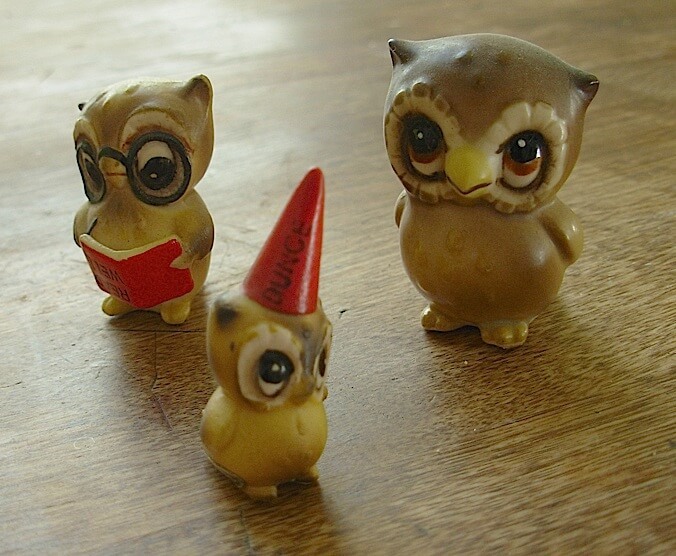 I either have (or did have……) two owls identical to the large one pictured. They are Josef Originals. Josef Originals ceramics were designed by Muriel Joseph George. The first pieces were made in California from 1945 to 1962. They were then manufactured in Japan. The company was sold to George Good in 1982 and he continued to make Josef Originals until 1985. The company was then sold to Southland Corporation. The name is now owned by Applause, and the Birthday Girl series is still being made. I’ve not seen the little ones, but they are cute as buttons! What sweet little owls. The two not wearing a hat have little bumps on their heads, like maybe they almost became salt and pepper shakers, but not quite. Why do they have bumpy heads, Rachel?